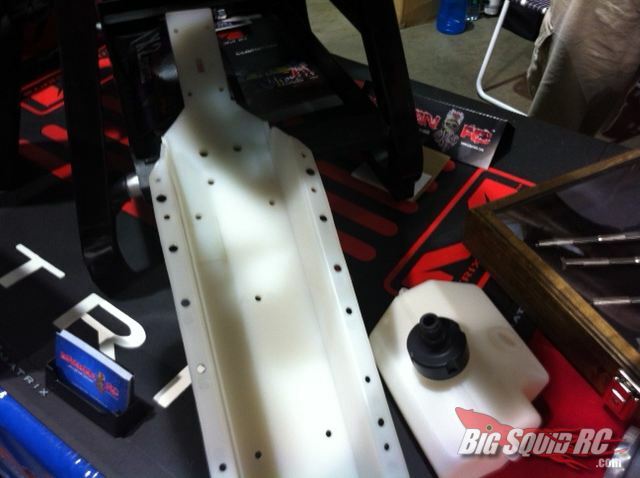 RCX 2012 – Kraken RC basher chassis for Baja 5 line. « Big Squid RC – RC Car and Truck News, Reviews, Videos, and More! Kraken RC is showing off their recently announced X2 chassis for the HPI Baja 5 line of vehicles. If it looks like a molded chassis, that’s because it is. In fact, it’s the first ever molded chassis for HPI’s 1/5 scale vehicles. It’s made from a specially formulated polymer created by DuPont, and Kraken claims it has great hardness, rigidity, abrasion resistance and thermostability, making for one durable molded chassis. But more importantly, Kraken says this chassis is made specifically for the basher crowd. That would be us. The X2 Chassis is also covered by a Limited Lifetime Warranty. Check out the Kraken RC web site for more details.